Hi guys! Happy Easter holiday! I hope you guys have fun looking for eggs and enjoying your chocolate! I know I will :) Today I've got not one, but 2 manicures to show you! I was doing Easter manicures and couldn't decide which one I liked best. So I'll just post them both and let you decide! Both manicures are done with a lovely polish from P2 called Crazy beauty, a periwinkle crème polish I thought would be great for Easter. The first manicure I did was the skittlette. I thought skittles would be fun because they look like Easter eggs! I used Wet n wild Black crème and Sinful colors Heavy metal to do some stamping (bm314 plate), an accent nail, a dotticure and some stripes (using nail vinyls). And I really love how it turned out! 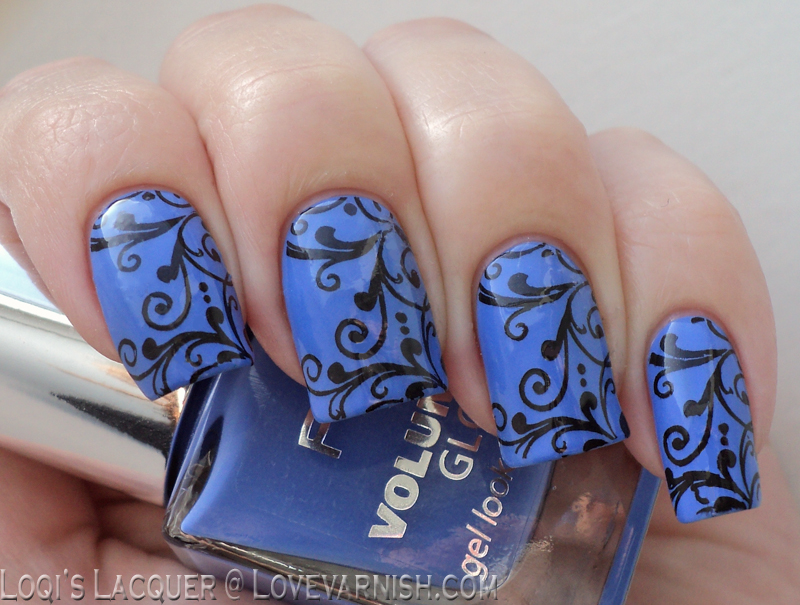 But....I also realy loved my pinky with the black stamping, it's one of my favourite stamping images. So I thought I would try a full manicure with the same pattern on all my nails. And I absolutely adore that one too! Hah! So It's up to you guys. With one do you think is the best looking manicure? The Easter egg skittles, or the black curls? Please let me know in the comments, and see you next week! Your blobs/dots are just perfect ♥ Love color combo too! 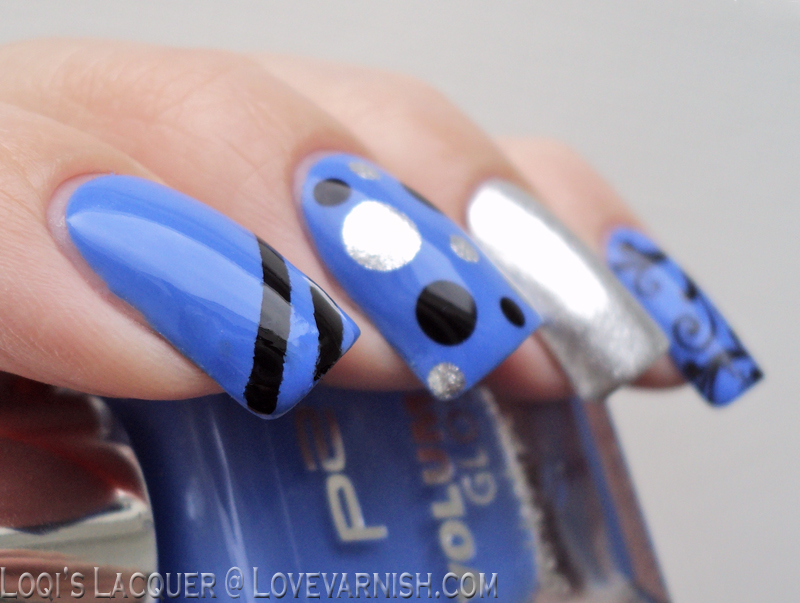 Love the second mani, the design in black against that blue is stunning! I absolutely LOVE the black swirly nails! I think both of the manicures look really good and I can't decide which one I like most. The stamping is so perfect, but the skittles mani is more fun to look st I think. Ohh, that is a lovely color! 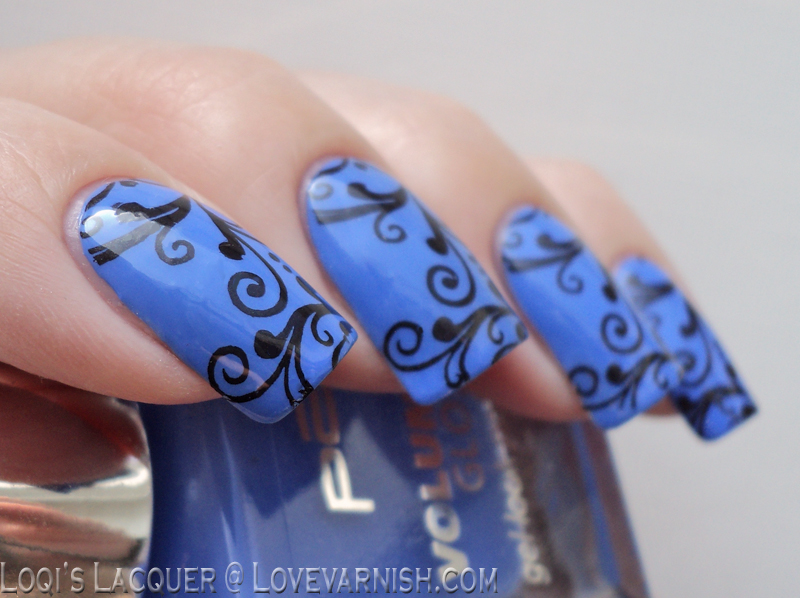 I love the swirls over it! I really love them both... but skittles are my first love! Both are beautiful! That blue is gorgeous! These are both gorgeous! I'm really partial to the one with the all black curls because I adore that stamping design! Thanks Bella! Glad you like them! I think I end up using too much polish and so it kind of ends up being *too* blobby. LOL. I love both, but the curls is so so SO pretty! both are gorgeous, but the second mani is my favorite! I love them both however, I think I'm team skittle. Both are fantastic! I think I like the skittlette a bit more though - skittlettes are totally my cup of tea. 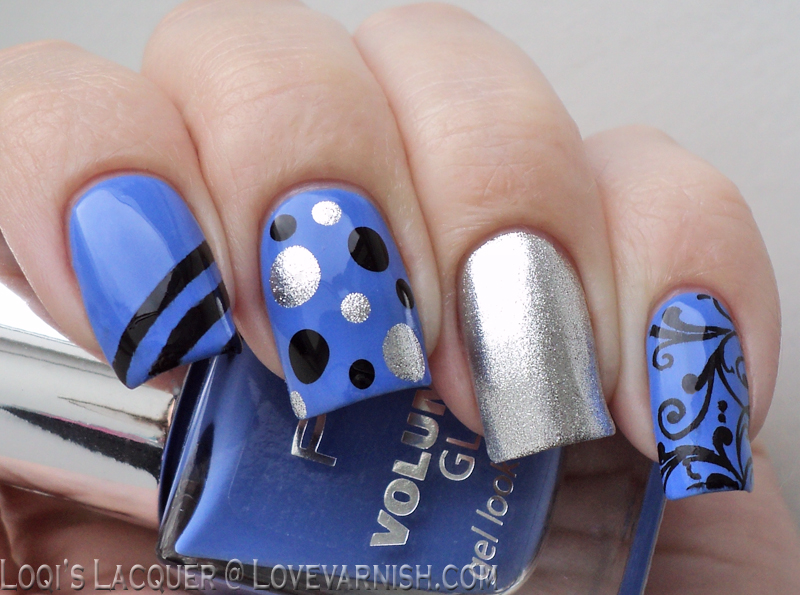 I like the full stamping best but these are both pretty. :) I'm loving that base colour! Both of these look great! Im normally a full stamping kind of gal but your skittlette has to be my favorite of the two. Thank you! I'm glad you like them! I wasn't sure if the curly design fit in with the other nails. Team skittle is pulling even with team curl I think! I love skittles myself as well. Thank you! The base polish is wonderful, such easy application!